This article is expected to be the first in which the magazine reports on local residents who have experienced a lifetime, or at least what feels like it, in one job. John Hartley begins our series. The two words ‘Hartley’ and ‘farming’ seem irrevocably linked in the Wychwoods. John Hartley spent all his working life on his mixed farm in Shipton, while second cousins, Mike and Richard, look after cereal and pig farms respectively in Upper Milton; Mike is, of course, the magazine’s regular farming correspondent. John’s is a long story. Raised initially in Hackney where his father had played football for Spurs, the family moved to Coldstone Farm in Shipton, next to The Lamb Inn. His earliest memory was of the shire horses being trotted down the lane from the Horse Ground off Simon’s Lane ready to start work each morning. There were cows to be milked at the Barn Buildings at Five Ways, and right from an early age, John was involved during the school holidays in farm tasks. This was followed by two years of National Service, a year on a progressive farm at Kelmscott as a student and a year at agricultural college; by now, farming was in the blood. There were up to sixty cows in the milking herd, a small flock of sheep and a healthy crop of wheat and malting barley. When his father died at the early age of sixty five, John took over. Such changes weren’t easy; quite apart from the responsibility involved, he was suddenly the boss, not one of the lads, but he was always blessed with a good bunch of workers, five of them in all. One who stood out was Owen Turner who overcame the loss of a leg in the Great War to work tirelessly, always whistling and never complaining. John remembers him positioned by the rick ready for threshing, swinging his creaky wooden leg, climbing onto the threshing machine where he would cut the strings on the sheaves, before throwing them into the machine; ‘Owen was extraordinary’ in John’s own words. But farming, like so much else in life, doesn’t stand still. When the stockman retired and the ageing state of the milking parlour was considered, John took the reluctant decision to close down the dairy business. Livestock were his first love, so the loss was acutely felt; one morning he was milking the herd and that same day, the cows were sold at auction on the farm. The cow sheds and yards looked horribly empty. For the first time in memory, there would be no milking herd in Shipton (there had been at least four at one time in John’s lifetime). Farming as a whole was changing beyond belief. Fewer but bigger farms, greatly increased mechanisation, improved strains of crops, wider use of chemicals; farming became more akin to an industry. John’s cattle had gone, just one full-time worker was needed, and retirement seemed the natural course. Much of his land was retained to be used by tenant farmers but his career was over. 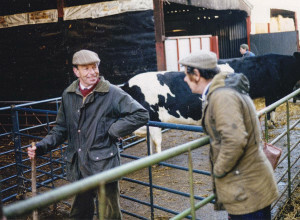 Asked for his favourite memory, John smilingly recalled the first day every spring when the cattle were let out into the fields after their winter confinement, running, even leaping and then settling down to some contented and much appreciated new grass, just one of a lifetime of great memories.